Step 4 - click the Save button. Step 2 - click the User Permissions submenu. 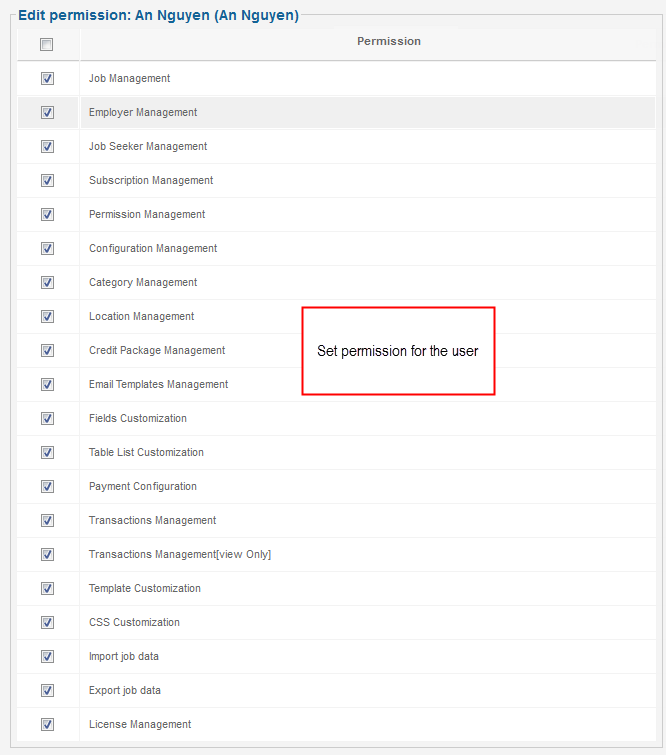 To edit a user's permissions, click on the name of the user that you want to be Job Board administrator/super administrator. Usually a Job Board administrator is given specific permissions, but super administrators are given all permissions. 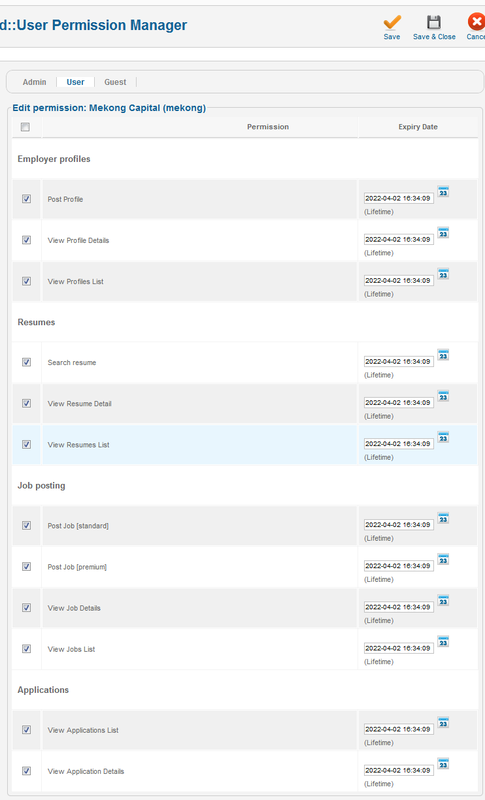 Below you can see the Job Board User Permissions panel. This is the list of Joomla! administrators and super administrators that the Job Board component recognize them as having administration rights. See the new administrator we have setup earlier? Please note: that a new Joomla! administrator has no administration rights in Job Board component but Joomla! super-administrators have full permissions. 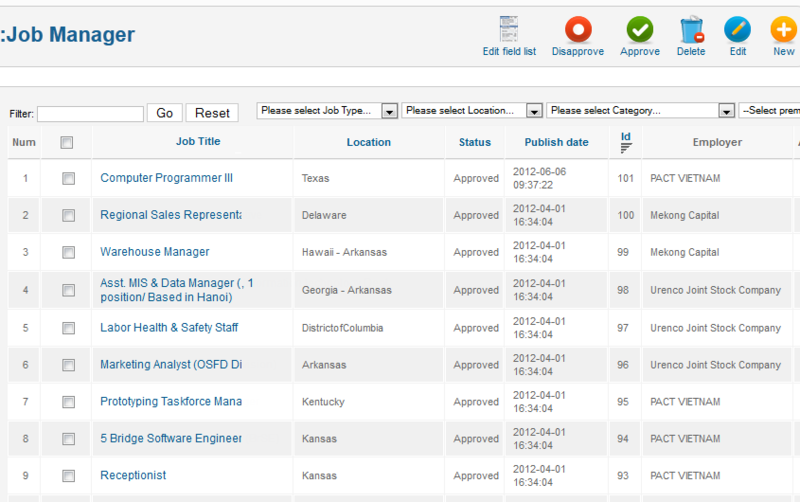 In the image below you can see back-end permissions list for the Job Board administration. To add permissions to the new Job Board administrator we have setup earlier, select the administration sections according to his/her expertise or qualification. Jobs form: Used to collect job information. Profile: Used to collect front-end user information. Resumes: Used to collect job seeker resume info. Applications: Used to collect job seeker's applications information. Forms are composed by many fields. Thus, any modification to fields will affect the above mentioned 4 forms. If you have enough permissions to customize fields, it is quite easy to edit these fields up to your expectation by changing HTML control that displays form's fields. By following the below steps and screenshot, you can easily change the field value type, validate fields input, add a new field, remove one field/select to display a certain field or not in a few minute. 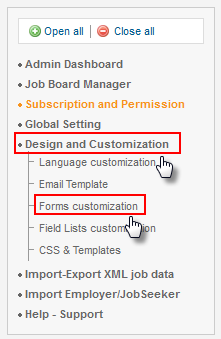 Step 2 - click the Form Customization submenu. Customizing forms & their corresponding fields is a task preferably for the development stage. On a production website, changing field types will produce loss of data and will require website administrators to request employers to update their active jobs according to the new job related field structure. Moreover, this task will be very difficult for large websites, so it is a reason just enough to consider building the right field structure from the start. All forms hold both system fields & non-system fields. The non-system fields are form specific, but the system fields are hold in almost all of the forms as the primary keys which connect database tables. It is recommended to back-up your website's database before changing anything in the Job Board field structure. Except for system fields, you can edit any of the non-system fields properties for all forms. However, for system fields you cannot change field name, field type and table name. Each form holds specific fields & each field has specific properties. For instance, you want to edit the Job code field from the Job form. In the left side of the image below you can see the field highlighted in red background. If you change field type to single select, radio or multiple select, then you should click the Apply button to save the new property, then you will see an Edit option link next to this property. Click that link to add options for the new field type if it does not have any select option. If you change form name of one field, then that field will disappear on the field lists of old form and appear on fields list of new form. Hence, you have to filter fields of new form to rebuild database. Please note that if you change field name, field type or table name, then you have to rebuild database. To rollback changes that require rebuild database, click undo link of the field that you want to reverse. In this section we will go deeper into the Job Board field properties and explain each property's functions. While editing a new field, the form preview in the left side will show no for preview. But after finalizing edit of the new field by clicking the Save button and come back to edit the same field, the form preview will show the new field at the bottom, highlighted in red background. Please note that the new field will not show in front-end or back-end forms until the database is rebuilt. Also note that you can undo adding the field to the associated form by using the Undo link of each newly-added field. We will explain below just how to do that. 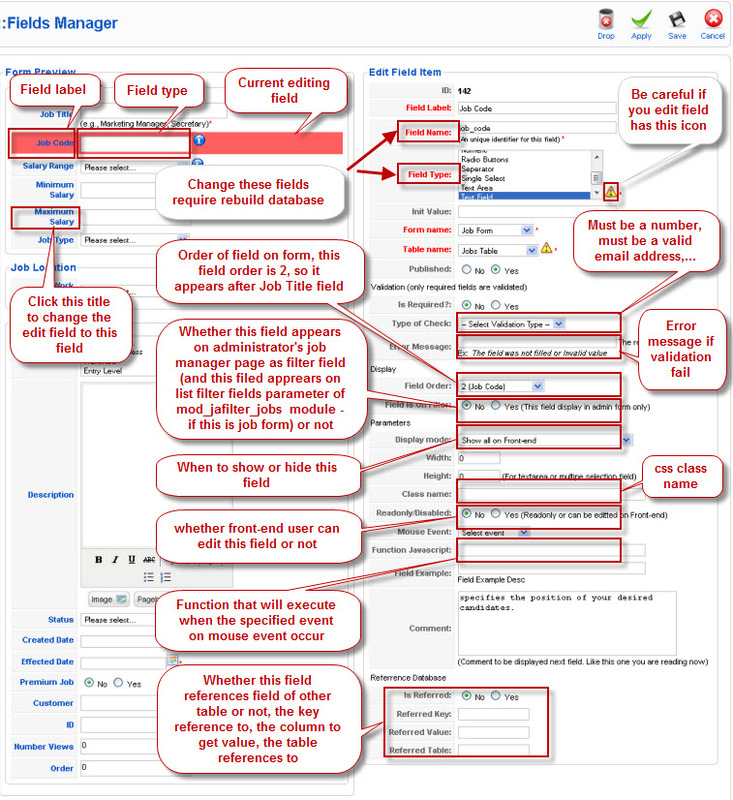 No - the field will not be displayed in front-end, but the field will always be visible in back-end. Error message - is shown in a pop-up window to instruct the user with examples on how to input a valid value into the field: "ERROR: You should type a number! ", "TIP: the date is not valid, please try YYYY-MM-DD HH:II:SS" (according to your general settings for date and time), etc. No - the field is not a filter. 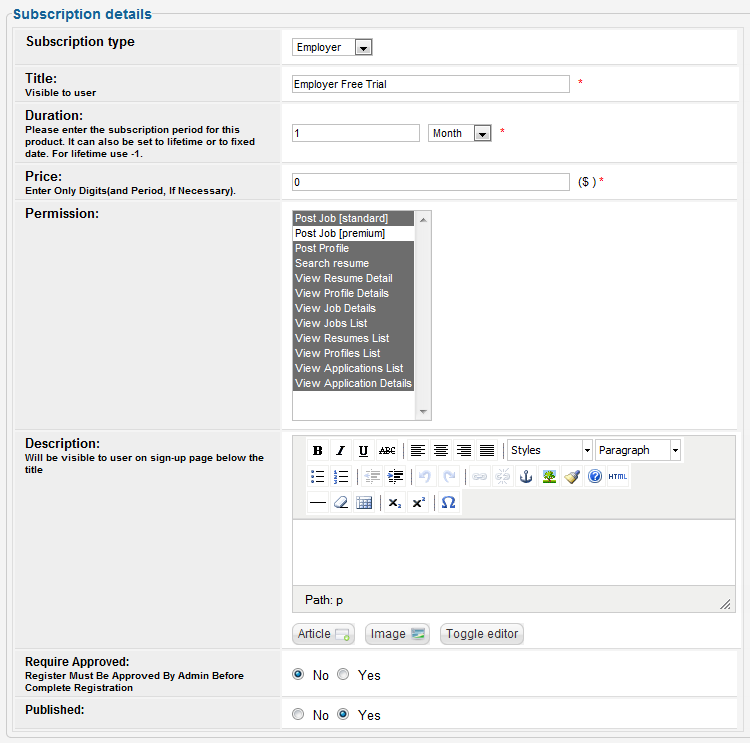 Comment - a simple description added next to the field to instruct the user how to fill up the field. Referred table - links the field to a specific table, according to the key referrence. On the fields list page, select the fields that you want to remove, then click the Delete button, click ok button on the confirmation dialog box. Be careful when you decide to remove a certain field, you cannot rollback to the fields that had been deleted. On the fields list page, you could easily recognize all newly added/edited fields that are highlighted in red background. That means these modifications have not been applied to the site yet, until database has been rebuilt. 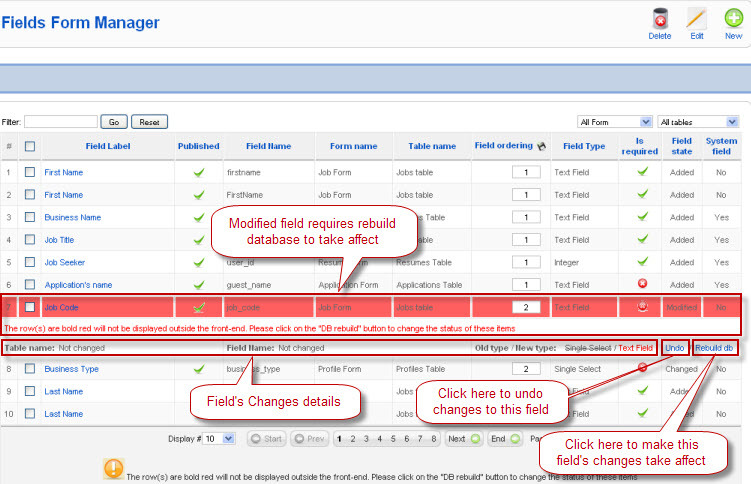 In order to make changes affect one field, click on click rebuild DB link of that field. A review changes screen will appear, after review field's change, click continue button and click ok button on the confirmation dialogbox. The modified field will be now available at the front-end as you wish. Review modified field require rebuild database. URL = a URL field type can be used for company website link or job seeker portfolio/blog. There are 4 displaying tables used on JA Jobboard for showing summary of a user peer'info collected from displaying forms as mentioned above. They are Jobs, Profile, Resumes, Applications table. Jobs table: used to display list of jobs. This table appears on front-end pages and on the administrator's job manager page. Profiles table: used to display employer info for job seeker or all other user's view depending on admin's configuration. Resumes table: used to display resumes info for employer or all other users'view depending on admin's config. Applications table: used to display information of applications for employer's review. Filter the displaying table that you want to customize. You can customize these tables by adding new column, removing column or changing column properties. It is more difficult and requires web designing excellence to customize the look & feel of your Job Board site. Thus, this section is recommended to administrator who is an expert in web design. Step 2 - click the CSS & Templates submenu. 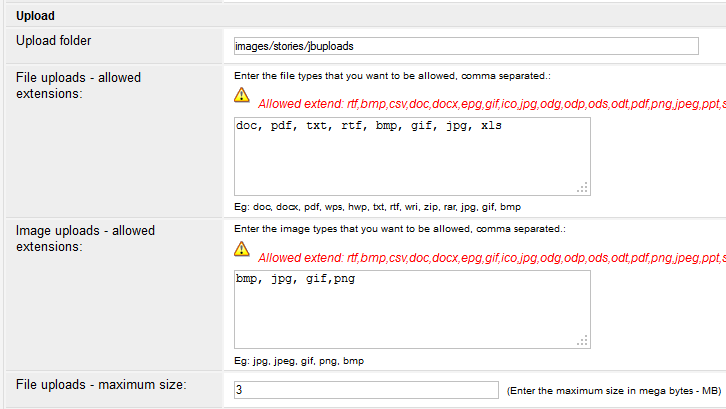 As you can see the message above the editor, it informs that changing the file will automatically create a template override for the view, but won't affect to the original code. To learn more about template overrides, please visit our designated documentation section. What is important to remember here is that you can change the class names, div IDs, or arrangement as you like. As well as use the new class names into your default Joomla! 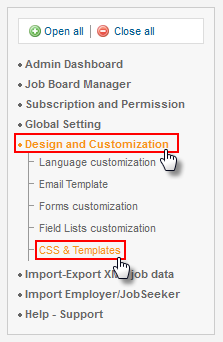 template, and style these classes and IDs both in Job Board CSS and the default Joomla! template CSS file. 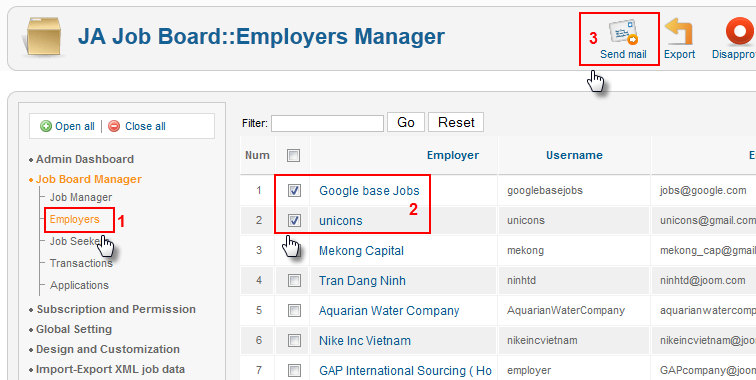 Here you can customize default Job Board HTML tags or your own tags. When you update Job Board, remember to back-up this file. 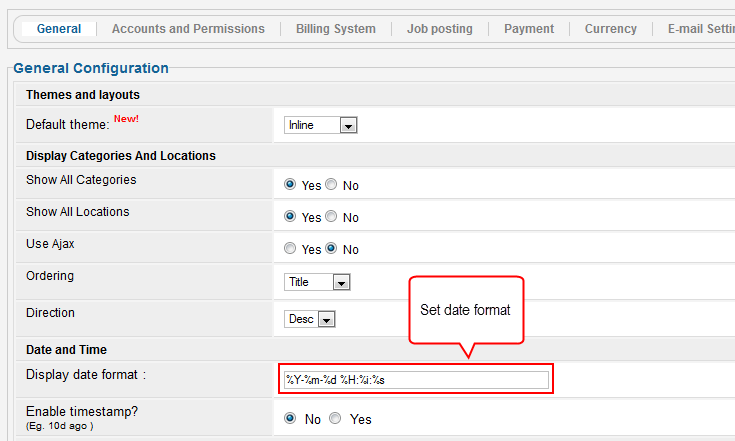 To customize date format, go to general section of system config category, enter the format that you want to display on the display date format textbox. Job board will translate the format as the following: %y to year's four digits, %m to month in number, %d to day in number, %h to hour in 24, %i to minute, %s to second. Visit manage email templates for more information. inline-light - similar to the second but this theme uses less coloring. Summary - display the jobs list in table with summary information. Noticed the row1 background color? You can change it with your desired color to match your website design. TIPYou can change the position from left to right for RTL websites. You may want to delete the color line, to make it use your template color for a items. Job short description uses no specific styling, as it is a simple text that inherits styling from the template for paragraph. You can delete the color styling for links to match your template styling. 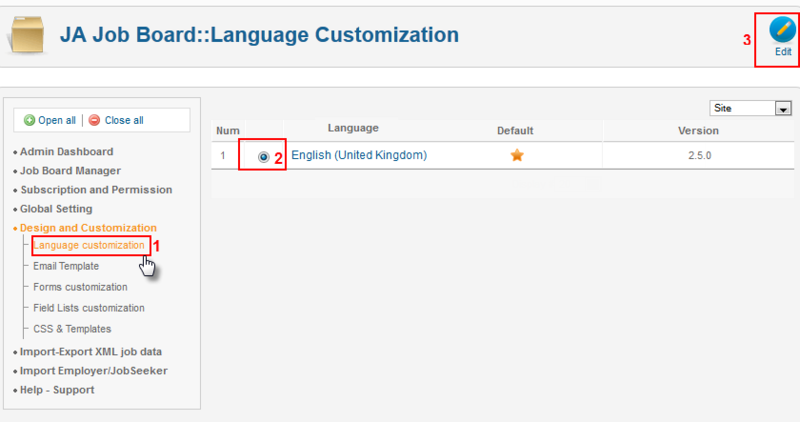 To add a new language to JA Job Board, first you have to check if your language pack for Joomla! CMS is installed, if not, please do so. 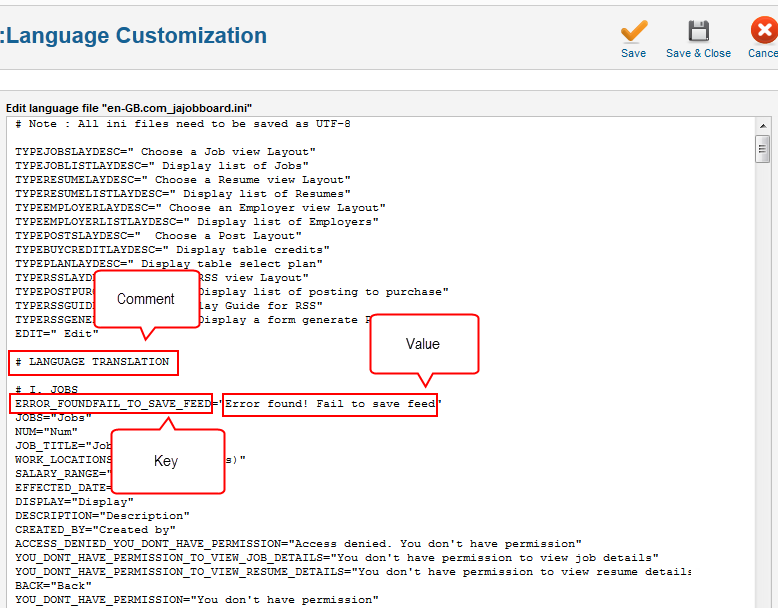 Then check the language customization menu, and you will notice JA Job Board automatically created the language files for your language in the Languages Manager page. If you have your own translations, please overwrite these files. If not, please select whether you want to edit site/admin language file. Then click on language name of your new language to proceed with editing. The language file editor will help you easily to edit your language but please note that this file contains key-value pairs. The strings from the left side of the equal mark " = " are the keys that must not be modified AND the strings from the right side of the equal mark are the English language strings you have to edit and translate to your new language. Please note that you have to check your language files on every JA Job Board update. To make it easier to find new language strings, we recommend using WinMerge, BeyondCompare, or any other file/folder compare solution. Please also remember to back-up your langauge files on every update of the JA Job component. 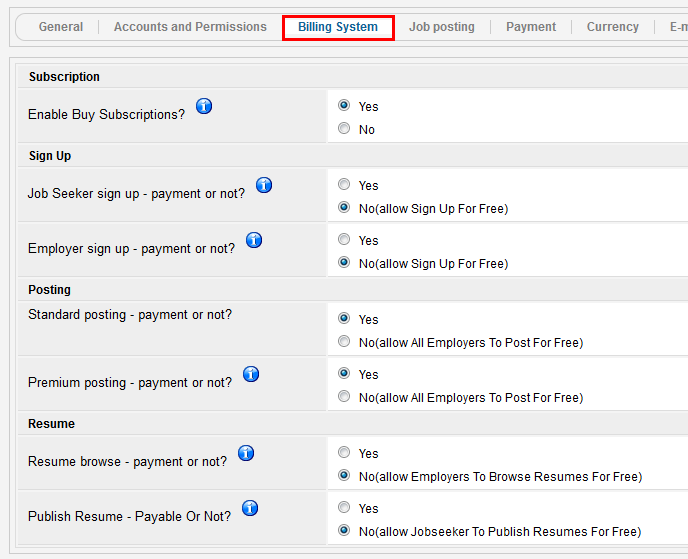 For now, Job Board has only one payment method, that is Paypal. If you want to implement another payment method, then you have to write it. To write it, your file should be similar to Paypal.php under components\com_jajobbord\asset\payments folder. 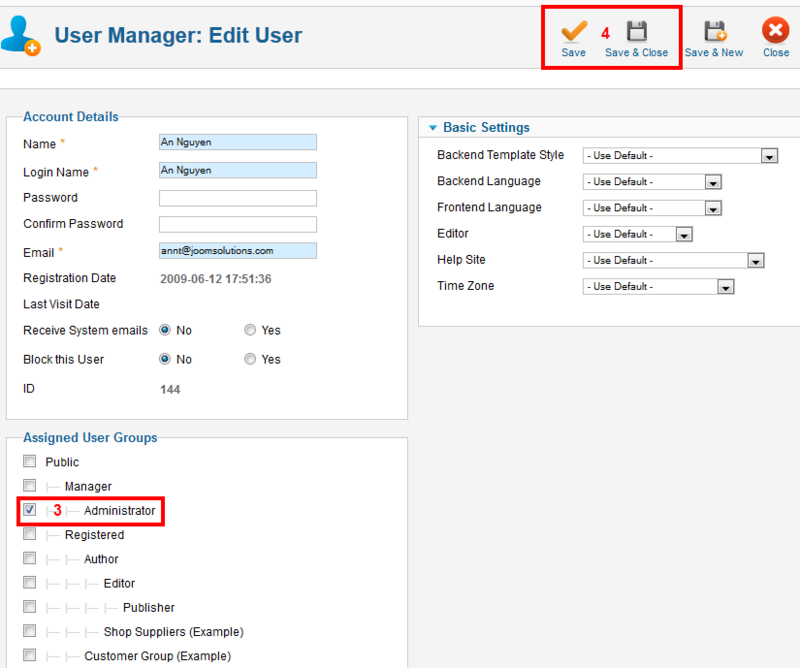 On Job Board, front-end user can upload CV, profile image, you can configure which file type is allowed to upload, and limit file's size uploading from general section of system config category. 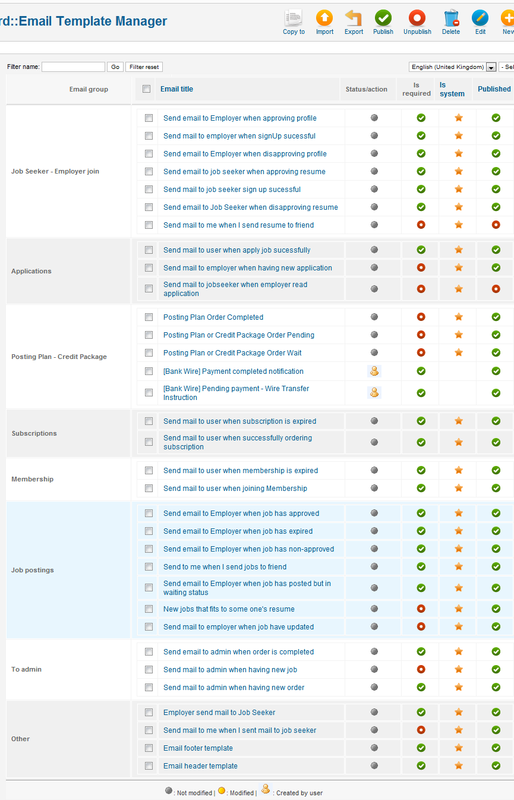 Email settings section of system config category determines whether Job Board can send email to front-end user automatically after some events occur or not, this section also sets email information on sent emails. Email templates are used for: - Sending mails to users/admin to notify of an event - To confirm a payment/an action on the site by users or admin. Currently, a list of English email templates for general & major events on a Jobboard site has been included on JA Jobboard by default. Webmaster can find it very easily and conveniently to duplicate these email templates into the language he wants at anytime. Moreover, the system itself will do the rest when the content has been changed into associated language while variables/params are kept unchanged. Jobboard maps the event that need to send email with the template name. 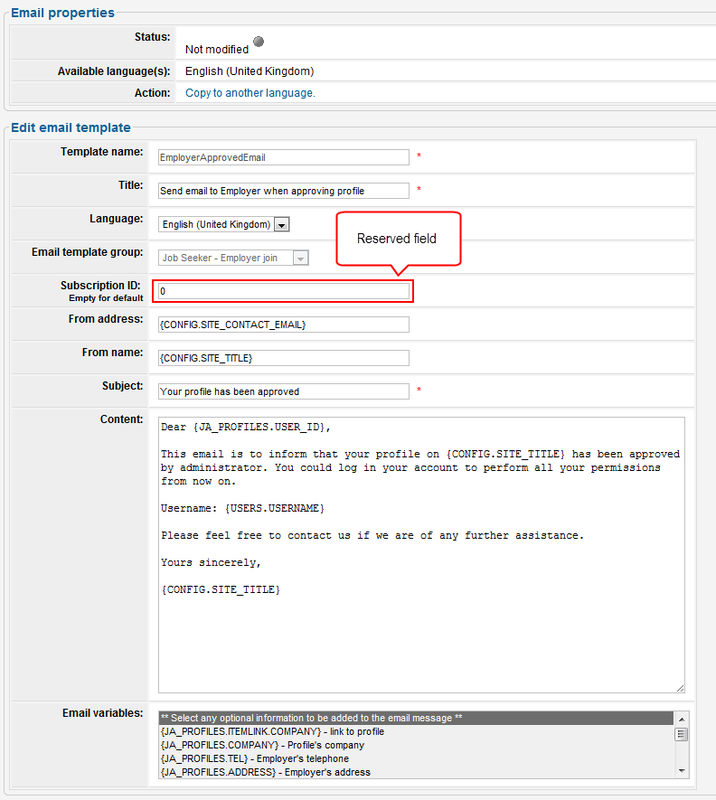 If Jobboard is enabled to send email automatically, but it cannot find out email template in the language that it has to send. 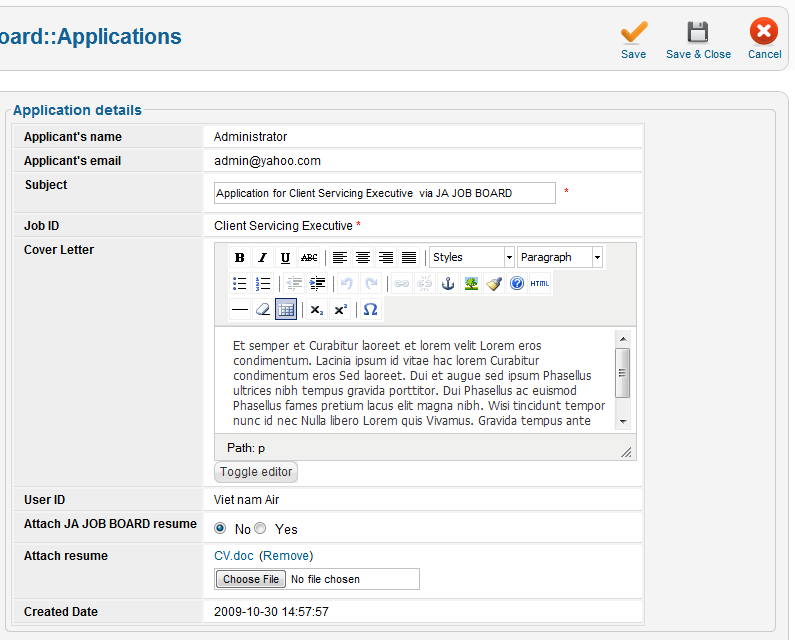 Jobboard will use the template in English as the default language. If the template in English does not exist OR is not published then a notification will display on user screen. Edit template: You can edit any email properties except the template name. Note you cannot edit the event that the template attach to, because Job Board maps the event with template name. Create new template: You can create a new template, but you can not set its name with one of system templates' name. Job Board allows to create template here so developer does not have to create it in database. 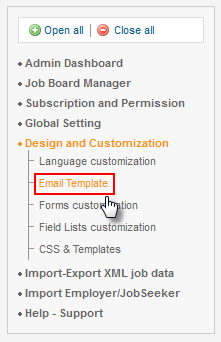 Export templates: You can export your template into text file, edit it, then import to Job Board. Import template: You can import template into Job Board from ini file. 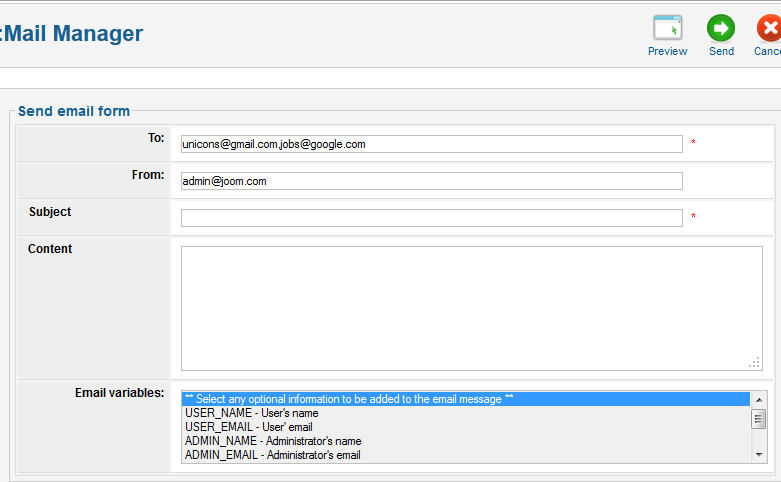 To send email to employers/ job seekers manually, on the employers manager/ job seekers manager page, select employers/ job seeker that you want to send email to, then click send mail button, a compose screen will appear, compose your email then click send button to send. Effectively managing and monitoring all user registration, permission and performances on Job Board is of great importance to the success of your Job Board. As a webmaster, you will find hereof detailed guidelines how to set system configuration, how to manage transactions, users of different types on the site as well as how to charge them for performing a certain kind of activities in an appropriate manner and purpose. On JA Job Board, only employers will be charged for a certain activities/permissions should these are configured payable by admin. Thus, all associated transactions by employers will be displayed on transactions manager page for day-to-day monitoring. Webmaster can edit transactions, reverse completed transactions, view customer invoice, view customer details, delete transactions. 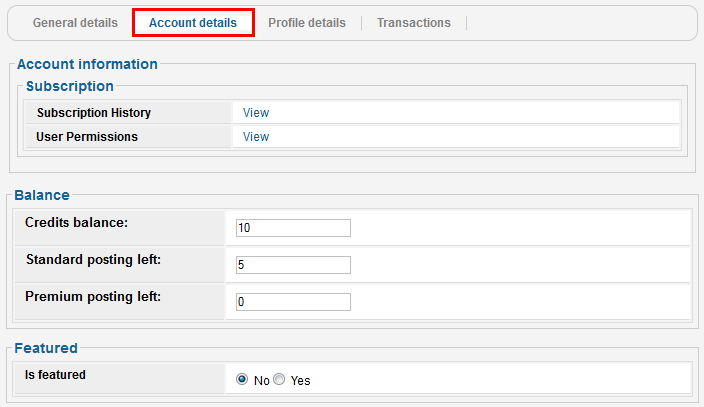 Each transaction is displayed on administrator page, and on employer page. 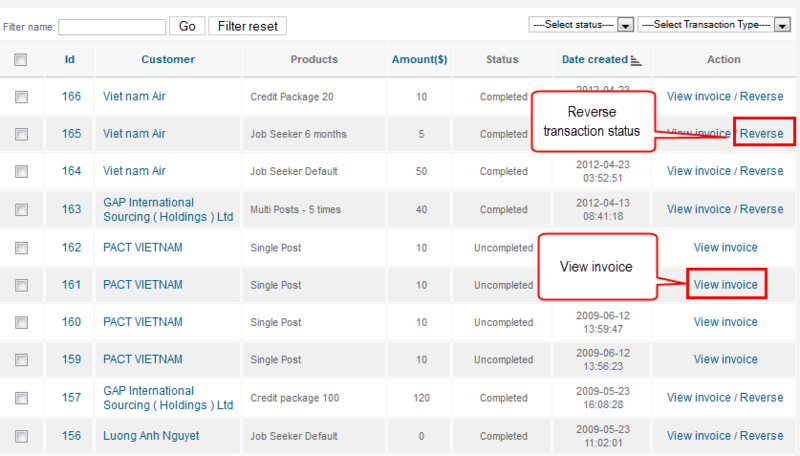 You can use transactions manager or go to employer's transactions section to manage transactions. Each transaction invoice has information like the following. The typical performances of employers on Job Board are inclusive of posting jobs and browsing resumes. 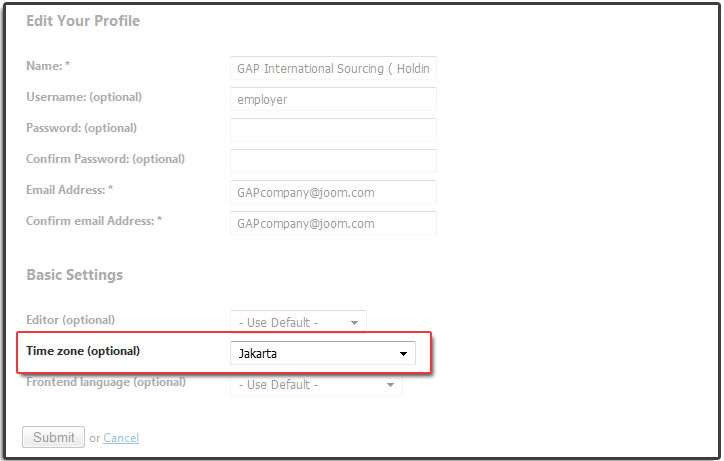 Should you want to charge employers a certain fee for performing one of the above mentioned activies, kindly go to Global config section and select system config. At system configuration window, you could configure the billing settings to determine whether employer is charged on resumes browsing and jobs posting jobs or not. Billing system settings. If employers are set to be not charged on posting job, then employers can post a number of jobs as specified on accounts & permissions section of system config category for free. 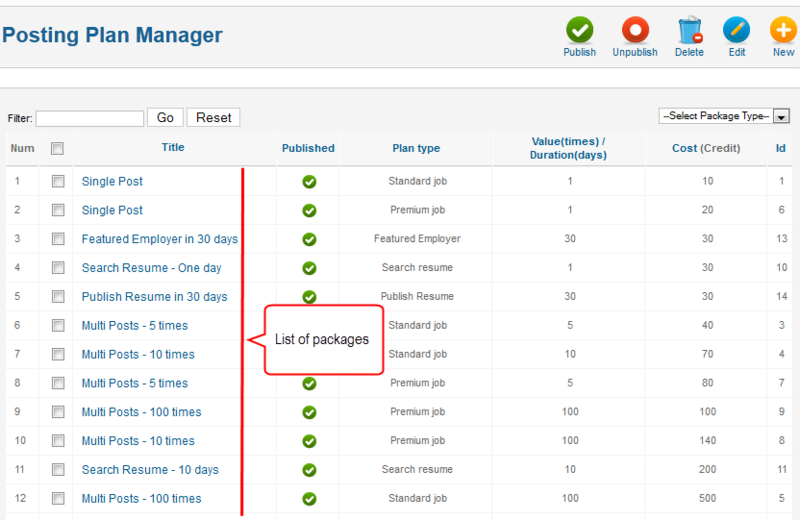 Packages offer various options of price & associated privileges for employer to post jobs or search resumes database. There are three types of posting plan: standard job, premium job, and search resumes. The standard job and premium job allow the employer post more a number of jobs as specified on posting plan, the difference between these plans are that the premium job will be highlighted on jobs list screens. The search resume plan allows employer to search resumes more a number of days as specified on the posting plan. 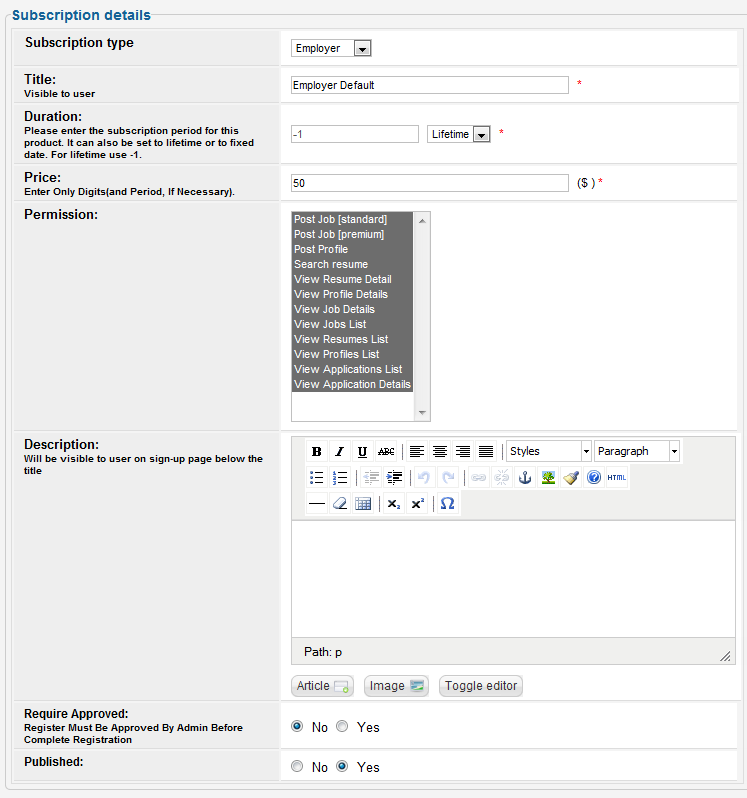 As a Webmaster, you can easily create, edit, delete posting plans as you want. You can view the number of remaining jobs that employer can post and the time that employer can browse resumes from employer account details. There are two types of currency on Job Board, real currency and special currency. 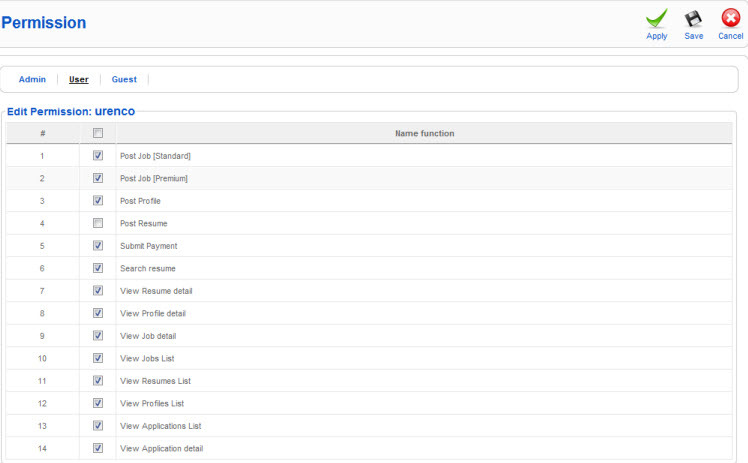 Job Board can use one type of currency at a time, this setting is on currency section of system config category. If this setting is set to real currency, then when employer buy somethings employer will pay the money directly through paypal, if this setting is set to special currency, employer has to buy credit package, and Job Board uses the money available of the employer credit package for payment, if the remaining money of employer is insufficient to post job, then that employer can not post job. Employer can now buy credit package by using paypal. To use paypal you have to set up payment information, this payment contact information will be display on the "Ship to" section in the transactions invoice. For now there is only one payment method, but you can install a new payment method, please visit add another payment method for more information about install new payment method. If currency settings set Job Board uses special currency, then employers have to buy credit package to buy posting plan. 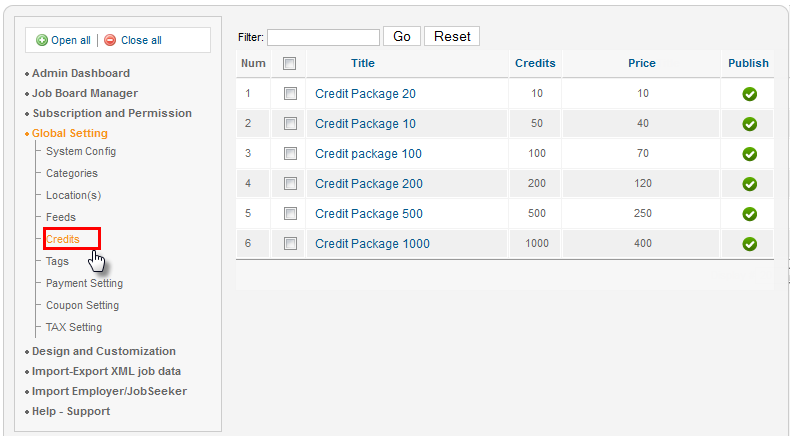 The credit manager allows you to create, edit, delete, publish, unpublish credit packages. Each credit has information like the following. You can view the number of premium and the number of standard jobs that employer remains, the amount of Job Board currency that employer remains on employer account section. On this section you also can view the time that employer can search resumes. One of important administrative task is jobs management, on Job Board you can do it easily, just go to job manager page, and you can do what you want. Each job has properties like the following. 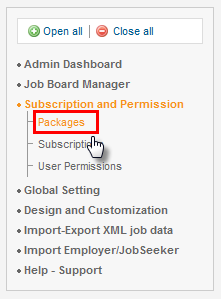 You can change job lifetime, default job status and other settings from job posting section of system config category. 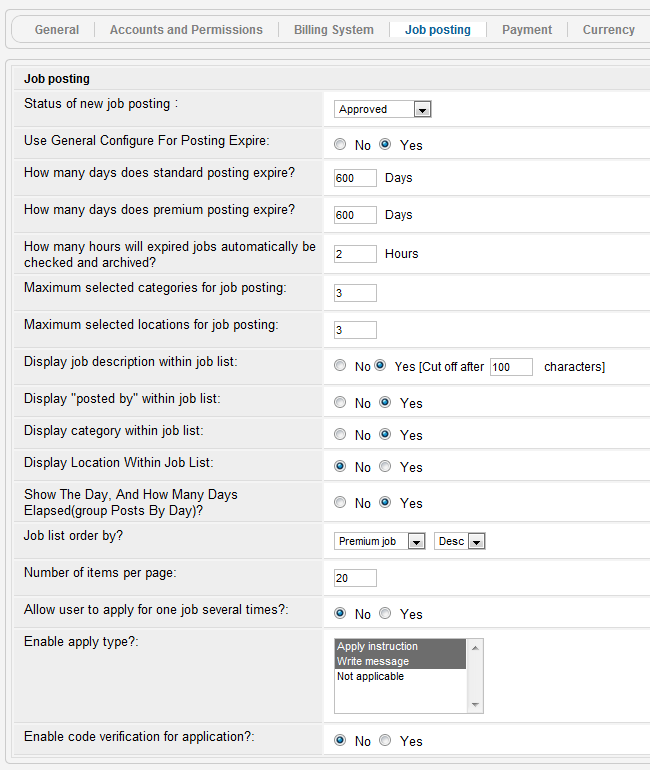 The How many hours Expired jobs will be automatically checked and archived setting sets the time interval that Job Board checks expired jobs and mark them as expired. Job is displayed on jobs screen only if the employer of that job is approved and is not blocked, that job is approved, the effected date property of that job is less than the current date time and that job is not expired. Jobs table displays jobs on front-end user pages, you can easily customize this table by using customize job/ profile/ resume/ application table. 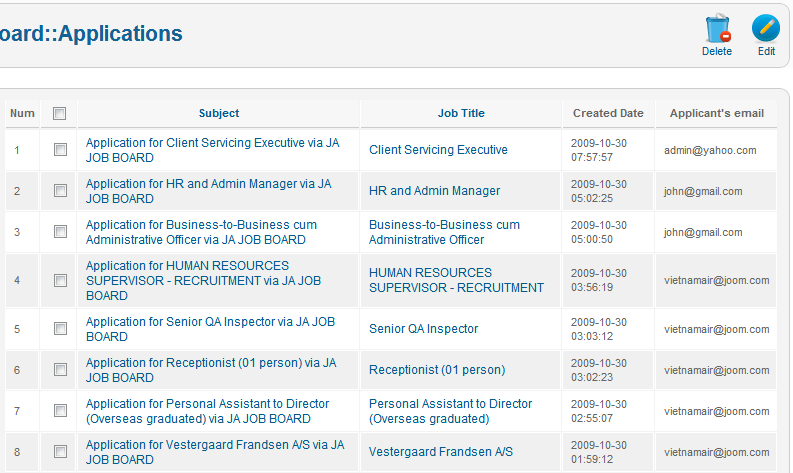 You can filter jobs by job title, work locations, job category, jobs status, post type. You can add other filter by customize Job form, set field is on filter property of the field that you want to be filterable to yes. Applications is sent to employers by job seeker users or guest users. You can edit, create new, delete sent applications from applications manager. If you delete one sent application then that application will disappear on applications list of receiver and applications list of sender. You can create application as guest but not as job seeker, if you create application then on new application screen, you have to enter the correct user id for application receiver and title id for job post id. After created, the new create application will appear on application's receiver. Each application has information like the following. 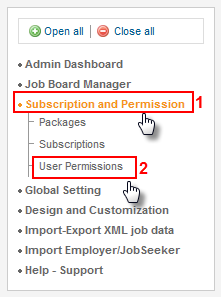 Job Seeker and Employer have their own subscription, the subscription regulates which permissions the corresponding type of user has by default. After signing up, these users must update their information and to become Job Board seeker or Job Board employer. After information is updated, depend on your settings on Accounts & Permissions section of System config category the user may need to be approved by Job Board administrator. Job Seeker can search jobs, view jobs, post their resumes, upload their CV, send application and CV to employers, save their favorite jobs. The default permissions and lifetime of job seeker are set by Job Seeker Default subscription. 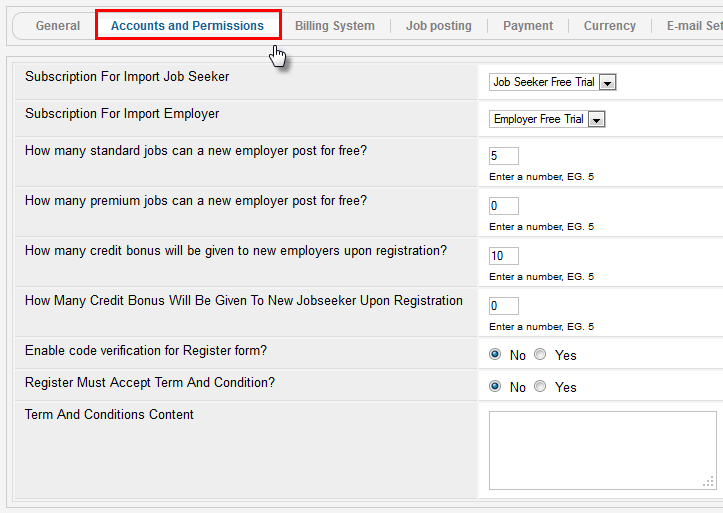 After created you can change job seeker permissions for each job seeker. Click on the job seekers category, on the row of job seeker that you want to approve, select checkbox, then click approve, or you can click the unapproved icon to approve or click the view resume link, then set approved property of the resume to yes. Employers can search, view resumes, post their jobs, view applications that job seekers sent, save their favorite resumes. What employers can do on Job Board is limited not only by permissions settings, but also by accounts & permissions settings, billing system settings. Billing system settings sets whether to charge employer fee on browse resumes or post job, the accounts & permissions settings sets the number of free jobs employer can post. The Employer Default subscription set default permissions and lifetime of job seeker. You can change permissions of each employer. Click on the employers category, on the row of employer that you want to approve, select checkbox, then click approve, or you can click the unapproved icon to approve or click the view profile link, then set approved property of the profile to yes. Guest users can search jobs, view jobs, send application and cv to employers. You can change Guest users permissions. Configuring correct timezone (for both server side and user side) will help to resolve a problem of diffrent timezone when publishing job. Assume that your server is placed in US (UTC-06:00), and one of your employer comes from Japan (UTC+09:00), so offset between two timezone is 15 hours. If you do not configure timezone for your server and employer, then employer's time will not be converted when creating job, and that is a cause of problem since Jobs will not displayed as expected time. The following is an example about this. We give a situation where timezone is a big trouble. Now, employer in Japan selects “publish time” for his job is “18h:00 - 10 Sep 2012” (UTC+09), and he expects that his job will be published in the next hour. But if timezone is not configured correctly, the “publish time” will be stored in database of server - “18h:00 - 10 Sep 2012” (UTC-06:00). And it will be published in next 16 hours (because current time in US is “02:00 - 10 Sep 2012”). That is incorrect. - Expectation: this publish time must be converted to “03:00 - 10 Sep 2012” (US time) when stored in database. So, to resolve above issue, you need config correct timezome for your site (in global configuration page >> server tab >> “location settings” section. Then ask your user to update their timezone to correct value. Follow the instruction to configure the timezone. To configure timezone for server, from back-end of your site, go to: Site --> Global Configuration --> Server then set the Server Time Zone under the Location Setting. Then Edit their profile to edit their Timezone.